I’ve been working on this book for two years now and it’s finally finished, in time for Lent. Christus Publishing from Wellesley, MA, a new publishing firm, asked me to write the book and I see they have it on their internet site today for sale. We’ll put it on Crossplace.com ,our Passionist site for selling books and media, as soon as we can. 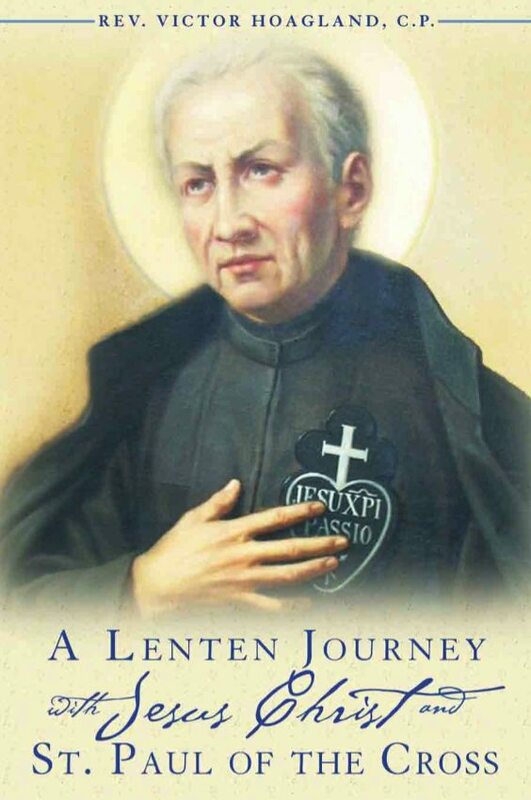 It gave me an opportunity to look again at St. Paul of the Cross, the founder of the Passionists, his spirituality and the community he founded. He was a great teacher of prayer, a gift we need today more than ever. He saw prayer as a gift given to everyone, and his letters to all kinds of people witness that conviction. I appreciated the opportunity to write a short biography of the saint; I don’t think I copied others exactly. He lived in an interesting time, when the Enlightenment was pushing ahead in Europe, changing the worldview of the church and society. We’re still feeling its affects. I read most of his letters while writing the book and was impressed by their earthiness. He was an earthy mystic who took people as they were and didn’t mind their darkness. I revised many of the present English translations of his writings for the book, perhaps for the better. A recent exhibit at the Morgan Library in New York City featured the letters of Jane Austen. Letter-writing was the rage from the 18th century on and Paul of the Cross used this “new” communication to reach others. He would be using the new media today, I think. I liked writing reflections for all the Lenten gospels for the book; the readings for Lent are indeed a treasure to be explored. Our catechesis and spirituality are becoming more biblically and liturgically based, and we need to see how a spirituality like that of Paul of the Cross fits in to this new trend. This entry was posted in Religion and tagged Enlightenment, gospels, Jesus Christ, Lent, Passionists, Paul of the Cross on January 31, 2011 by vhoagland. According to his biographer, St. Athanasius, St. Anthony of Egypt, one of the great spiritual teachers of the early church, grew in holiness by going about “like a wise bee,” visiting every flower, and making the gifts he found in others his own. He was a spiritual competitor, engaged in holy rivalry. Some years ago there was a book about religious communities called “A Concert of Charisms.” Each community has its own gift and in concert religious communities make beautiful music. But how about holy rivalry? Yes, we can kill each other competing, but holy competition isn’t the worst thing in the world. There’s something healthy about it. Surely, the Benedictines realize they’re competing with “The Magnificat” and “Daily Bread” “The St Joseph Missal” and a good number of others in the field, each with their own gifts and approaches. Hooray for the Benedictines and their embrace of holy rivalry. I’ll be looking forward to seeing the new production. How about some holy rivals for EWTN? This entry was posted in Religion and tagged Anthony of Egypt, Benedictines, competition. Give Us This Day, d, Passionists on January 30, 2011 by vhoagland. By looking on Paul simply as a distant historical figure or a Christian hero we diminish what we share with him. “Paul more than anyone else, shows us what we really are, and in what our nobility consists, and what we are capable of. Each day he aimed ever higher; each day he rose up with greater ardor and faced with new eagerness the dangers that threatened him. He summed up his attitude in the words: I forget what is behind me and push on to what lies ahead. When he saw death imminent, he bade others share his joy: Rejoice and be glad with me! And when danger, injustice and abuse threatened, he said: I am content with weakness, mistreatment and persecution. These he called the weapons of righteousness, thus telling us that he derived immense profit from them. “ He boasted of constant beatings, abuse and cursing as though he were taking trophies home on a triumphal procession, giving thanks to God for it all. The only thing he really wanted was always to please God. “He knew himself to be loved by Christ. Enjoying this love, he considered himself happier than anyone else; were he without it, it would be no satisfaction to be the friend of principalities and powers. He preferred to be thus loved and be the least of all, or even to be among the damned, than to be without that love and be among the great and honored. This entry was posted in Passionists, Religion and tagged Conversion of St. Paul, Jesus Christ, Liturgy, Passionists, Paul the Apostle on January 25, 2011 by vhoagland. Today it seems we’re forever planning for the future. One big reason is the changing times we live in. No one today can sit still and say “My life and my surroundings won’t change; they’ll be the same forever.” From the big world we live in to the small world of our everyday lives, things are continually changing. We have to keep our eyes on the big picture, which is the plan of God. Today’s Office of Readings offers a quotation from the Second Vatican Council’s decree “Lumen gentium” that, at first sight, may seem far from our present situation, but really sheds light on it. “But the plan of salvation also includes those who acknowledge the creator. In the first place among these there are the Moslems; they profess to hold the faith of Abraham, and along with us adore the one and merciful God, who will judge mankind on the last day. “Nor is God himself far distant from those who in shadows and images seek the unknown God, for it is he who gives to all men life and breath and every other gift, and who as Saviour wills that all men be saved. “Those also can attain to everlasting salvation who through no fault of their own do not know the gospel of Christ or his Church, yet sincerely seek God and, moved by grace, strive by their deeds to do his will as it is known to them through the dictates of conscience. Nor does divine Providence deny the help necessary for salvation to those who, without blame on their part, have not yet arrived at an explicit knowledge of God but who strive, aided by his grace, to live a good life. We need to have this larger dimension in mind when we plan, especially if our planning involves the church. Too often we plan in a small, protective way. This entry was posted in Religion and tagged Church, Jesus Christ, Passionists, plan of God, planning on January 19, 2011 by vhoagland. Last weekend I was over at our monastery in Jamaica, Long Island, to participate in a program: Called by Name. It’s for young men who might be interested in joining our community. No one came. Maybe the weather had something to do with it, but I don’t think it had that much. Afterward, three of us who were there to offer some input sat around and talked about vocations to the priesthood and religious life; our conversation gradually went beyond those callings to the whole question of vocation itself. The word “vocation” comes from the latin word, “vocatio,” meaning a call, an invitation. The first vocation we have is God’s call, God’s invitation to life in this world. We have been invited to life on earth by God, and he calls us to do certain things in our time here. We have been called by name, individually. The human family has a collective destiny here on earth, but each of us has something to do. Then, God invites us to another world, we’re called to another life when our years here are done. It’s important to remember this, because we tend to believe that we choose life and everything involved in it, and God has nothing at all to do with it. That’s not so; God has invited us to live, and our happiness depends on how we accept the call we have received. One of the priests I was with last week told us the story of his own vocation. He’s a young priest, who was raised in a Catholic family that gave him the best of everything. “But I didn’t know what I wanted to do in life,” he said, so his parents persuaded him to study to be an engineer. It’s a good job, good pay. So he studied and got an engineering degree and landed a good job. But he said he wasn’t really happy with his life; he felt it wasn’t what he was meant to do. Finally, after praying about it and discerning about it, he became a priest. This is where he belongs, he told us. The tragedy that’s just occurred in Tuscon may remind us of the on-going nature of a vocation. A congresswoman goes out for an ordinary meeting with her constituents, her assistant goes along in her company, a federal judge in her community stops by to say hello, a husband and wife join the group, a little girl interested in politics also joins them. You never know the consequences of your life. That day they had to live their lives in exceptional circumstances. I suppose that 9 year-old Christina Taylor Green was one we noticed particularly in the tragedy. It wasn’t just because she was so young, but because she was so alive with so much promise, so much spirit. There was so much of a calling in her. She seemed to be someone our world needs. That the theme of today’s scripture reading at Mass. Our first reading from the Prophet Isaiah says that that we called from the beginnings of our lives, from the womb, to serve God. That call from God goes on to the end of our lives. It’s not something small or negligible that we’re called to do. “I will make you a light to the nations, that my salvation may reach the ends of the earth.” We have a role to play in the mysterious plan of God. Every few months, a man from California calls and asks for 1,000 or 2,000 little leaflets that we distribute from our place in Union City. It’s a leaflet entitled “Be With Me Today, O Lord.” He gives them out to kids in school and puts them in the back of churches. It’s a simple little reminder that God calls us. We have a vocation. “Today is new unlike any other day, for God makes each day different. Today, God’s everyday grace falls on my soul like abundant seed though I may hardly see it. Today is one of those days Jesus promised to be with me, a companion on my journey, and my life today has consequences unseen, my life has a purpose. May all I do today, begin with you, O Lord. Plant dreams and hopes within my soul, revive my tired spirit: be with me today. May all I do today continue with your help, O Lord. Be at my side and walk with me; Be my support today. May all I do today reach far and wide, O Lord. My thoughts, my work, my life–make them blessings for your kingdom; let them go beyond today, O God. Maybe someone will hear that message someday and say, “I think God is calling me to be a priest.” I hope so. This entry was posted in Passionists and tagged call by God, called by name, Christina Taylor Green, Passionists, priests, Tucson, vocations on January 16, 2011 by vhoagland. A familiar question kids ask on a journey. So we give them games to play, tell them to go to sleep, or just shut up and wait. As we go through life, not only kids, but all of us ask: Are we there yet? We are on a journey, a sacred journey, the Letter to the Hebrews says. Yet even on a sacred journey you can get tired. The Letter to the Hebrews– which we read in the next few weeks in the lectionary– is addressed to tired Christians. Would that be us? Our ancestors, on their great journey from Egypt to the Promised Land, also experienced weariness, we’re reminded, and that led to discouragement and even rebellion. Despite the promises made to them and the signs of God’s power given them, they faltered. The desert journey got too much for them. Nothing big caused them to fail, just the weariness that came from being on the road day by day. Are we there yet? No, but we’ll get there soon. This entry was posted in Religion and tagged Jesus Christ, journey, Letter to the Hebrews, Passionists, tired on January 13, 2011 by vhoagland. Matthew’s gospel was the gospel most used for catechesis in the early church. It also plays an important role in the creation of our Christmas season. It gives us the Feast of the Epiphany, for example. Jesus Christ came for the gentiles as well as for the Jews. When Pharisee and Sadducees come for baptism, John calls them “a brood of vipers” because they presume they are saved as “children of Abraham.” “God is able to raise up from these stones children of Abraham, “ John says to them. Baptism is not an entitlement. Baptism is a commitment to repentance. That’s important for us to realize too. But repentance is a difficult path. Can we do it alone? John continues in Matthew’s gospel with the promise that one more powerful than he is coming. “He will baptize you with the Holy Spirit and fire.” When we are baptized into Christ, we are given the Holy Spirit and his fire to continue on the path of repentance. Christmas is not just for looking at the Child in a manger; it’s a call to enter into the mystery of Jesus Christ. This entry was posted in Religion and tagged Baptism, Christmas, Christmas season, Epiphany, Jesus Christ, Matthew's gospel, Passionists on January 3, 2011 by vhoagland.